I don't think you or Jungledoc have to worry about lack of work. They will have the same amount of strength, and will be able to lift the same poundage. But the fat guy will lift less weights on barbell because he has to move his fat, too. So maybe it depends on the place where the extra fat is stored. If it is in legs, it won't be too big problem for deadlifts as if it were in arms or somewhere up there (like in head). I think that no-one is thinking about the effect of bouncing of that fat in certain lifts, like in squat. Yeah, but those machetes are much of what my job is all about. I wouldn't mind losing it, though, if it were because the people of the PNG Highlands had stopped chopping each other. Person A weighs 158lb and has 22% body fat. Person B weights 139lb and 11% body fat. If they both are equally trained then it is possible to have same strength. What is the ideal percentage of fat for women of 25-30 age around? 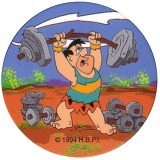 Jungledoc wrote: I think most people can maintain strength while losing fat, if they train hard, and lose slowly. It's easier to gain strength while maintaining or gaining weight, thus the common practice of cutting and bulking. Yes if you cut down your calories slowing and calmly while doing proper exercise so it easy for you to maintain strength.